From August 28, 2015 to January 16, 2016, LancasterHistory.org’s Stoudt Gallery will feature the works of Florence Starr Taylor. Guest curated by Ron Ettelman, Florence Starr Taylor’s Legacy will display many pieces of art created by this well-known Lancastrian. Florence Starr Taylor was born in Lancaster County on April 4, 1904, a date she saw as auspicious. 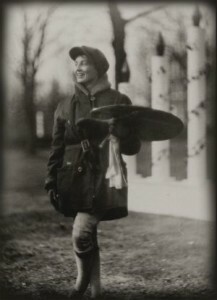 Her life “officially began” with her art studies at the Pennsylvania Museum School of Industrial Arts in 1922. After graduation, she was invited by Louis Comfort Tiffany to study with a select group of fellow artists. Florence led a charmed life. She was a pioneer who broke the gender barrier as the first woman reporter/artist at the Lancaster Intelligencer. Known to many as “Flo”, she was the first staff artist at fledgling PBS TV in 1965. When they needed call letters, she chimed in “Its top flight” for WITF. Florence supported herself working for Lancaster companies such as Hamilton Watch, Armstrong and many others. She also did countless portraits of Lancaster’s children and their parents. With her shining spirit, she was one of Lancaster’s greatest volunteers. Florence was recognized for her tireless efforts with the Red Rose Award. This exhibit seeks to celebrate the legacy of Florence Starr Taylor—one of Lancaster’s treasures.